in the 19th century by city founder Isaiah David Hart for use as a public “square.” On the 150th anniversary of the park, a few fast facts are offered. In the 18th century, before there was a park or the town of Jacksonville, the first road into Florida, the King’s Road, was constructed on an old Indian path that moved through the eventual northeast corner of the park. Area slave, April Saurez, under the direction of local physician, A.S. Baldwin, planted live oak trees throughout Jacksonville before the Civil War, including trees at the eventual park site. In the early years, the site was known simply as City Park. 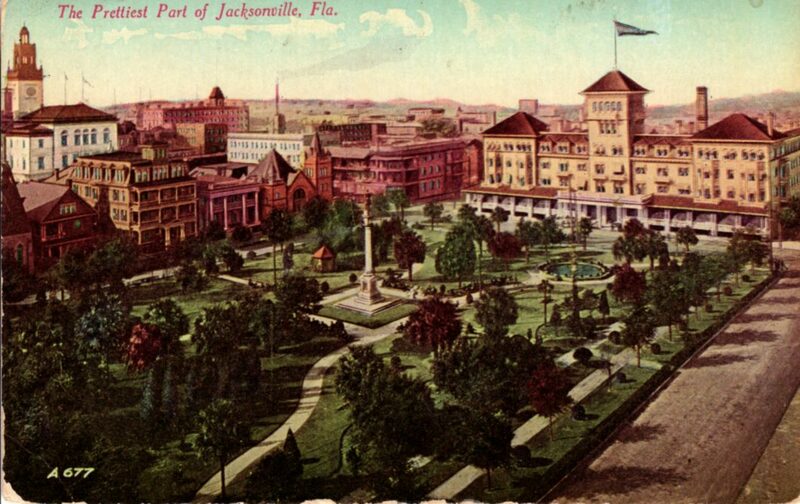 As the town of Jacksonville and its tourist industry grew, the park was called St. James Park, referencing one of the city’s largest and most venerable hotels on Duval Street across from the park. A little more than three decades after the end of the Civil War, former Jacksonville resident Charles C. Hemming donated the Confederate Statue for the park. In 1899, local lawmakers, in honor of the donor, renamed the park, Hemming Park. The Union General and President Ulysses S. Grant’s grandson was on site at the park for the Confederate Statue’s unveiling, along with thousands of Spanish American War troops gathered in Jacksonville at the time. Through the decades, the city has used Hemming Park as a respite, a landscaped walkway, a transportation hub, a place for individuals to meet and interact, an major entertainment venue, a gathering site, a celebration destination, and a greeting place for out of town dignitaries, including U.S. Presidents. U.S. Presidents associated with appearances at or next to the park include Grover Cleveland, Theodore Roosevelt, Franklin Roosevelt, John Kennedy, Richard Nixon and Dwight Eisenhower. During the Great Fire of 1901, citizens rushed to the park with possessions, believing the park would not burn, but the fire raced through the park with subsequent reports that the statue’s base glowed red from the fire’s heat. Following the fire, Hemming Park became a tent city for many of the city’s homeless residents, and the tent city was ably run by some of the city’s leading citizens. Jacksonville was rebuilt at dramatic speed after the Great Fire with many of its most important and enduring structures fronting the park, including the Windsor Hotel, the Snyder Memorial Methodist Church, Cohen Brothers in the St. James building and the Western Union building. Hemming Park was an important gathering site to promote World War II bonds and where on duty military gathered during war years. City Hall was relocated to the St. James building, fronting the park, in December 1997, in recognition of the Prairie School style building’s grandeur and architect Henry Klutho’s design that complimented the building’s position on Hemming Park.